This weekend, I had a lovely spring-reminiscent time with my mom. We ate dinner with my cousins, went to the Battle of the Bands, went to Sunday brunch at Pecan (who wouldn’t take my groupon without it being printed), went to the Georgia Aquarium, and spent more time with my cousin Kesha, who grilled for us. While eating last night, we talked about our family and some of the little hush hush things about which our family never talks. One of those issues is color. Because of my family’s lineage (maybe one day I will expound), there exist(ed?) some superstitions and prejudices about darker hued skin and resulted in differences in how kids and grandkids were treated. It’s always been fascinating to me. Maybe because I am brown. Just a pretty, smack dab in the middle, smooth, lovely brown. I’m not light. I’m not dark. I’m brown. A shade my ma said was “light enough” to escape the punishment issued to those who were “too dark.” Even when I was a kid, I wondered what I would have looked like if I had come to the world looking like any of my cousins (on my mom’s and dad’s sides–on my mom’s side, I’m one of the darkest). We pretty much are the three shades of the Kenya dolls back in the day. Light, medium, and dark, lol. I can remember walking into the kitchen hearing my parents arguing about who had the most color in their history–bragging on how dark my granddaddy was or how dark my ma’s granddaddy. Kinda weird since outside our home, I would hear other groups of blacks vying for who had the least color. I never really understood the psychology of color. This may be one reason that New Orleans has always been one of my favorite, mostinteresting places. 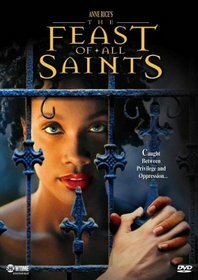 I remember the first time I read Anne Rice’s Feast of All Saints, really imagining this world of quadroons and people basing status on how far removed they were from slavery or how “whitened” they had gotten their blood. So I was very very happy to see how engaged the Atlanta group was while watching Part 1 of the DVD based on the book. Our conversation was very lively. We spent a good bit of time talking about the purpose and benefits of marriage. One reason, which really made me go hmmm melikey, was that marriage is an institution that assists us in moving forward and building our culture. We talked about how marriage is used strategically, but the real question is what is the strategy? Where are we headed? One thing I said was that if everyone did what they were put here to do, collectively we would all prosper at a faster pace than each of us individually–thus, our goal should be to marry someone that helps us in our purpose, that supports and uplifts us, that complements us. Some people are all about marrying for love–well I would say that’s all good and fine, but it’s not. Why? Because we may not have any control over our emotions per se, but we totally can control who we spend substantial time and energy with/on. In the movie, the strategy was a combination of their perspective of bettering their lives by “marrying” into money and into lighter skinned children who would be able to keep the cycle going. What’s your strategy? In that same discussion, we talked at length about whether or not we have to “play by the rules” in society. Well whose rules are they? My personal opinion is that we need to know the rules–not necessarily play by them unless that’s just what you choose to do. If you know them, though, you can use them and play around them. Another thing we ended up discussing (because we live in Atlanta and that’s what we discuss) was how as we get older, our pool of romantic possibilities gets smaller and smaller, not only because we’re second and third rounders (more on that in a minute), but also because our circles just overlap and overlap until the point where it’s rare that you meet someone completely new. The answer? Some say we should start going to the gym or somewhere completely new. We’ll see. So I’m a “second-rounder” (well, I guess I should hope that I am??). One of our group members says that the first round of marriages occurred around 25. The second round will occur around 30; the third round, 35; and so on. And some of those first-rounders have come back around to be second-rounders because of divorces (you know, because some of those first-rounders were in starter marriages). This was an interesting concept (and hilarious since one friend said she’s a sixth-rounder even though she’s my age). I guess it applies to motherhood as well since a large crop of folks had babies last year, evidently drinking the same water. Something else we discussed was how important knowing our history is. In the movie, the main character Marcelle finds out that the Haitian Revolution wasn’t just some great, fun story to hear about–it actually directly affected his life. He starts to make really crazy decisions because he finds out that he never knew that he didn’t know important parts of his history. He doesn’t know who to trust–he doesn’t know what is really important–he really doesn’t even know what to do with his life. Be who his mom and aunts want him to be? Or follow his passions? That applies to our lives as well. We have to know where we came from, understand where certain gifts come from and how they can be used, and take advantage. We may not have the generational monetary wealth and connections that some are born with, but we are born with certain generational gifts and lessons that we only have to seek out. I’m really glad that we watched this movie! The yearning for lighter skin is among many “colored” cultures. The top sales for skin whiteners are in India and Middle Eastern countries such as Lebanon, Dubai, etc. I also heard just this passed weekend, the Jamaican artist Octane having a serious discussion on the Joint this weekend. What’s sad is that with the whole natural hair revolution is that really Black people have not adjusted that they can be successful without conformity or imitation. It’s 2011 and we’re just getting products that are for BLack women’s hair without a relaxer! However, it takes real research to find a beautician that does natural Black hair as it natural grows out the scalp. At some point, we have to learn that hey I’m Black, and I’m okay with that. The more we accept ourselves, the more society will accept us. I really like this post. I really felt like I attended the discussion. I’ve never read any of Anne Rice’s work, but with a endorsement from you, I guess I need to get up to speed. Only thing I know of her is she separated from Christianity a few months ago. “One thing I said was that if everyone did what they were put here to do, collectively we would all prosper at a faster pace than each of us individually–thus, our goal should be to marry someone that helps us in our purpose, that supports and uplifts us, that complements us.” I couldn’t agree more. The first/second rounders label was hilarious! Eugene Robinson is great. Hope the book will be too. Thanks for reading and commenting! 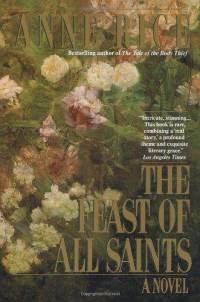 If you do read Feast of All Saints let me know what you think. I never read her vampire books, but her historical fiction is great. She found Christianity late in her career. I said I’m gonna read the series she put out recently. She still believes in Christ. I think her issue is with the hypocrisy or short sight of the institution of religion. Kinda weird though. Please please also let me know what u think of Disintegration.